When my boys were little, they would gobble up their fruits and vegetables. For whatever reason, though, as soon as they started going to school, they simply stopped liking them. I can’t tell you the number of times that they have brought home fresh pineapple or cantaloupe in their lunch bags. It drives me crazy. In the last year, I have tried to sneak fruits into home-baked goods. 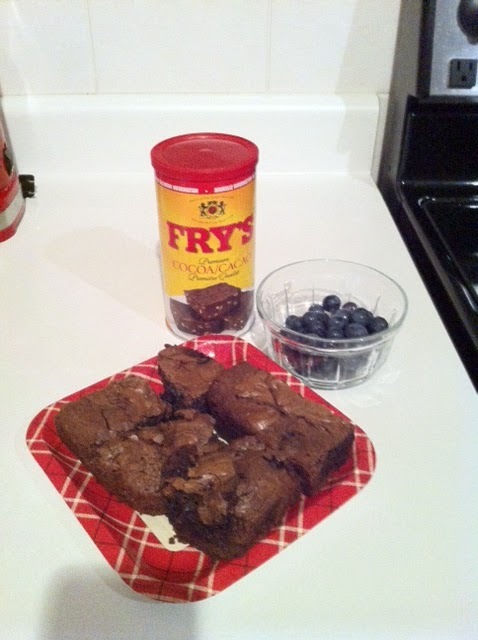 With blueberries so yummy at this time of year, I found a recipe for delicious brownies. Preheat oven to 350 degrees. Spray pan with Pam. A. Put margarine and blueberries in a pot and simmer over low heat until the margarine has melted. B. Mix eggs and sugar in a separate bowl. Add a spoonful of the blueberry mixture to it (so you don’t end up with scrambled eggs!). C. Add the egg mixture to the saucepan. Mix well. D. Stir in cocoa, flour and baking powder. Mix until combined. E. Stir in chocolate chips. F. Bake for 25-30 minutes (until a toothpick comes out clean). My oldest couldn’t wait to try these. Of course, I didn’t tell him that they had blueberries. He sunk his teeth into one, said it was really good and, then, commented that it tasted different. After eating it, Skipper noticed that the plate had a purple mark. I also gave some brownies to my coach and to my teaching partner, and both raved about how good they were. When I made another batch for my co-worker, she refused to share them with anyone. I like these because they were so easy to make. And, unlike my children, any chance to mix fruit with chocolate is just fine with me. Those look divine! I had the same issue here. Very good eaters as toddlers, then it all went to hell in a hand basket when they got older. YMX is only available on line here now too. Wish shipping to Canada wasn't so $$$.